A bizarre promotional video for a property in Sydney, Australia has gone viral. Developer Johnny Ronan beaten in bidding war by former RGRE employee. Famously curvy street could get tolls in San Francisco, Harvard students end goat-roasting tradition, and more B9336278255Z.1. A decade after Lithuania became Europe's testing ground for austerity, the dark days of the crisis are once again a popular topic of conversation. A television anchor who grilled a young renter on air before arguing members of her generation “don't know how” to handle the rental process has gone viral. The Wall Street Journal says the mall may not be able to pay its mortgage when it comes due in June. 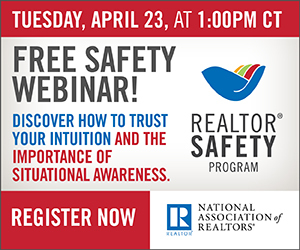 NAR PULSE—In a free webinar from NAR’s REALTOR® Safety Program, Danielle Martin, founder and ambassador of True Boundaries, will explain how to trust your intuition and the importance of situational awareness. Join us on April 23 at 1 p.m. CDT.